“He raises his head and she looks into the eyes of a predator. So dazzling… She almost has to look away from the blaze. They seem to drip silver – like liquid mercury escaping from a broken thermometer. Marie O’Neal used have life, a family, friends. But that all changed when she met Theo, her maker. Now Marie now longer existed… She was Moth, a new fully fledged vampire, and one that Theo is in trouble for making. With the Vampire council on their backs and mysterious deaths happening around the city Moth really doesn’t need the added pressure of forbidden romance on her plate, but she just cant help falling for the boy who’s father wants to kill her. I loved this book. I’m not usually a huge fan of vampires because of how overdone they were after twilight but I’m seeing fewer and fewer appearing and when I give them a chance I’m more often than not very impressed. 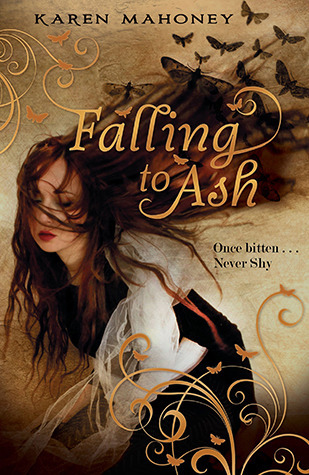 Falling to Ash is a typical vampire book, featuring action packed events and a sprinkle of romance and it really doesn’t disappoint. The story is a little slow to get going, but we’re told about certain aspects which are important later on in the book so that can be forgiven. I enjoyed taking the time to get to know the characters though and the first death happens fairly early on and you know right from the start that it’s got something to do with Moth. I loved the supernatural CSI type vibe I got from the story. The characters were pretty cool and I loved the battle that Moth was fighting, she was trying to keep a hold on everything that made her human but it was becoming increasingly difficult and I liked that struggle, it made her into a very interesting character. For one she had the problems with her ‘true’ family (as in the humans she was born and raised with) and then the first death appeared to be connected to her, then a vampire hunters son was on her case and her maker was acting weird, and thats all before the stuff with the vampire council. She was very conflicted and wanted to keep a hold on her humanity, taking care of her sister and developing feelings for Jace, but knowing she couldn’t and there would be things she’d have to give up sooner or later. Jace was an ok character but he was a little muddled at times, I think it was probably to do with his father and his families past and the relationship with Moth which he shouldn’t be building on, it all made for a good story but there didnt seem to be a lot to him, there was no real substance other than little snippets, just enough to like him but I didn’t love him. His father however really got my feelings stirring, wow I did not like that guy, what a prick. He hated all vampires and I can kinda understand to an extent but I really didn’t like his attitude towards Moth, especially when she hadn’t even asked for what happened to her. Theo was a really interesting character and he scared me a little but I kinda liked him, just also resented him for what he did and does to Moth. I think my feelings towards Theo were to do with the fact the book is told from Moths perspective though, my feelings were very much tailored taking into account the things he did and said to her and her taking them in. I really loved getting the story from Moth as a first person narrative and thought it made her struggles much more personal for the reader. I think the dialogue was probably more to my liking that the actual narration but thats not because the narration was bad, the dialogue, especially between Moth and Jace flowed so well and Moth was so snarky that I couldn’t help but love it. The story had elements in it that I likened to the TV show True Blood and there were a few kinda pop culture references that I really liked, I loved the writing style and I would really recommend Falling to Ash to anyone who loves a good paranormal romance with humour and snark. Falling to Ash is published today by Corgi. My copy was sent in exchange for an honest review. There is a prequel Novella entitled Moth and an accompanying webcomic series called Moth Tales which you can view here. Fab review. I completely love the book.